Do you remember when you were a kid and the family television screen displayed nothing but the invisible man in a snow storm if the aerial wasn’t positioned exactly so? It was always worse when you had a portable television with one of those loop aerials which was supposed to sit on top, but if you got the angle out by a fraction of a degree, or it was just half a millimetre too high or too low, you could forget watching the latest episode of The Sweeney or Starsky and Hutch. I’d forgotten what a lottery it was getting a decent picture on the telly back in 1975, but thanks to the wonders of our long-term Dacia, I’ve recently been reminded all too clearly. Not because our Duster features a built-in TV you understand, but because the touchscreen display became distinctly unwell. Having written in my introductory report that I wasn’t expecting the Dacia to give any problems, before those words had even gone to press ñ and before the car had racked up 600 miles ñ the screen had failed. The failure wasn’t catastrophic, however, as it was still possible to switch between radio stations if you could decipher what was on the screen. Using the rear parking camera or navigation system was out of the question, but while the visuals were worse than useless, the sound that emanated from the system wasn’t affected. As a result, it was possible to listen to the radio or stream music, while the Bluetooth continued to be usable, too. The biggest problem with the wayward display was how distracting it was as it flickered constantly, which was especially annoying after dark (which is most of the time during the winter). It’s possible to turn the brightness down, but only so much, and the first thing that any passengers noticed when they sat in the car was how the display was broken and annoying. And of course the people noticing were the same people that I’ve spent ages trying to persuade that Dacias are a safe place to put your money thanks to excellent reliability. The fault cropped up during the Christmas break, but Dacia snatched the car back straight into the new year to fit a replacement screen; the car has since been returned and all is well once more. We were given a courtesy car identical to ours, but this low-mileage loaner had a faulty fuel filler release mechanism which meant it was all but impossible to refuel the car, which was also rather annoying. 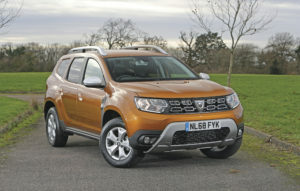 Our Dacia hasn’t shown any signs of such problems, and having taken our Logan MCV Stepway to 11,000 miles without a hitch before the Duster arrived, I’m really hoping that from here on it’s plain sailing. In an age of distinctive lighting thanks to LED technology, the Duster’s rear lenses look really rather neat, even though they don’t incorporate LEDs. The seats could do with being more supportive. They’re not uncomfortable as such, but they are rather flat, which becomes apparent on longer journeys.